Although it is commonly assumed that consumers benefit from the application of competition law, this is not necessarily always the case. Economic efficiency is paramount; thus, competition law in Europe and antitrust law in the United States are designed primarily to protect business competitors (and in Europe to promote market integration), and it is only incidentally that such law may also serve to protect consumers. That is the essential starting point of this penetrating critique. 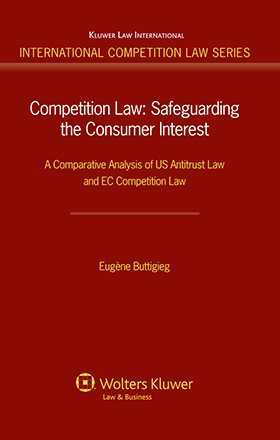 The author explores the extent to which US antitrust law and EC competition law adequately safeguard consumer interests. Specifically, he shows how the two jurisdictions have gone about evaluating collusive practices, abusive conduct by dominant firms and merger activity, and how the policies thus formed have impacted upon the promotion of consumer interests. He argues that unless consumer interests are directly and specifically addressed in the assessment process, maximization of consumer welfare is not sufficiently achieved. control mergers in such a way that efficiencies are passed directly to consumers. The author argues that, in the last analysis, the promotion of consumer well-being should be the sole or at least the primary goal of any antitrust regime. Lawyers and scholars interested in the application and development and reform of competition law and policy will welcome this book. They will find not only a fresh approach to interpretation and practice in their field – comparing and contrasting two major systems of competition law – but also an extremely lucid analysis of the various economic arguments used to highlight the consumer welfare enhancing or welfare reducing effects of business practices. Preface. Table of Cases. Table of Legislation. List of Abbreviations. 1. The Objectives of Competition Policy and the Consumer Interest. 2. Goals Underlying US Antitrust Law. 3. Goals Underlying EC Competition Law. 4. Collusive Practices and Consumer Interests. 5. The Legal Exception in Article 81 EC and the Consumer Interest. 6. Abusive Pricing and Consumer Interests. 7. Abusive Non-Pricing Practices and Consumer Interests. 8. Merger Control and Consumer Interests. 9. Efficiency Claims in US Merger Control – Safeguarding the Consumer Interest. 10. Consumer Interests under the EC Merger Control Regime. 11. The Way Forward. Bibliography. Index.